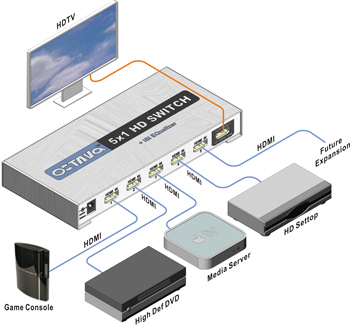 This Octava HDS5 5 x 1 HDMI Switch share your HDMI or DVI-D sources with a single HD monitor. This unique switch allows you to switch between 5 HDMI sources (set top box, DVD players, video game stations, computers) and your Hi Def monitor. This switch passes both digital and audio signals through the HDMI ports! Clear EYE transmission line and ISI reduction design will ensure pristine digital video signal from source to display. The Smart Scan algorithm intelligently selects the correct HDMI source so you can enjoy the program instead of fumbling with the remote. Approved by Wives and Kids! HDMI is backward compatible with DVI-D. This Octava HDS5 5 x 1 HDMI Switch will work with either DVI or HDMI. We understand that you may have a "mixed" system and require different cables. We allow you to choose the type of cable that you need during purchase. Smart SCAN algorithm intelligently selects the correct input. Approved by Wives and Kids! The HDS5 switch allows you to switch up to 5 HDMI sources (set top box, DVD players, video game stations, computers) to your Hi Def display. This Octava HDS5 5 x 1 HDMI Switch passes both digital and audio signals through the HDMI ports. Supports high-resolution video 1080 P, 4k UHD (3840x2160@24 Hz). Smart Scan algorithm intelligently selects the correct HDMI source for touchless video switching. Why not buy this Octava HDS5 5 x 1 HDMI Switch today?